It's Spring! And you know what that means, don't you? It is time to increase our use of sunscreens and our level of sunscreens. In the winter when the sun is gone and it's gloomy you might be able to get away with a daily use of a SPF 15 but in the Spring and Summer you need to definitely use a daily SPF 30 or higher, depending on how much time you spend in the sun, how fair you are and how quickly you burn. Personally, I pull out the big guns for most days and use a SPF 30 or SPF 50. Recently I tried Exuviance's Sheer Daily Protector SPF 50 PA ++++. Let me tell you, this is a quality product that does not chintz on the sunscreen or the anti-aging qualities. It is nice. This is a triple anti-aging fluid that provides sheer MINERAL UVA/UVB protection against photodamage and multi-antioxidants to help neutralize environmental damage. It has titanium dioxide 7% and zinc oxide 6%. It provides sheer mineral UVA/UVB protection that enhances natural skin tone; broad spectrum SPF 50 to protect against photodamage, the primary cause of signs of aging; PA++++ highest level of UVA protection; multi-antioxidants help neutralize environmental damage; Green Tea Extract helps protect cellular DNA for healthy skin and a virtually invisible universal tint smooths imperfections and helps even tone. The best thing about this is that the sunscreen is mineral in nature and can be used by those who are allergic to chemical sunscreens. Sheer Daily Protector SPF 50 PA ++++ is a weightless fluid that blends effortlessly on clean skin, or layered under makeup as part of a daily skincare routine. The broad spectrum SPF 50 protects against photodamage, the primary cause of skin aging. The ultra-fine transparent mineral sunscreen in a virtually invisible universal tint smooths imperfections and helps natural skin tone appear more even. Multi-Antioxidants Vitamin E and Lactobionic Acid fortify skin’s natural defense, scavenging free radicals brought on by daily environmental aggressors before they can cause premature aging. A PHA/Bionic complex helps prevent collagen breakdown to maintain a healthy skin matrix and firmness, and helps prevent signs of photoaging such as lines and wrinkles. A highly purified and concentrated form of Green Tea Extract reduces cell breakdown and helps protect cellular DNA for healthy skin. PA++++ is the highest level of UVA protection. It is suitable for all skin types. This product is fragrance-free, paraben-free and oil-free as well as non-acnegenic and non-comedogenic. It is important to protect the skin from both the UVA and UVB rays. Both can cause skin cancer. UVA rays are the ones that cause you to tan and age you but they can still cause cancer. UVB rays are the ones that burn the skin and those are the ones that do cause cancer the most. It is important to protect skin from both rays. Make sure your sunscreen has a broad spectrum suncreen in it that covers UVA and UVB rays. 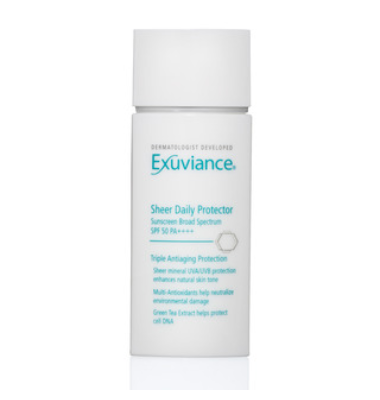 Exuviance Sheer Daily Protector SPF 50 PA ++++ retails for $42.00 and can be found online at www.exuviance.com, www.dermstore.com, www.ulta.com and www.skinstore.com. Exuviance is one of the brands that is under the NeoStrata Skincare company. Like NeoStrata on Facebook: https://www.facebook.com/NeoStrataCompany; Follow NeoStrata on Twitter: @neostrataskin; Follow NeoStrata on Pinterest: https://www.pinterest.com/neostrata/; Follow Exuviance on Instagram: https://instagram.com/exuviance/; Follow NeoStrata on YouTube: https://www.youtube.com/channel/UCf_jdb_vpqIWkgUcNRHIWIA; Follow NeoStrata on Google+: https://plus.google.com/+NeostrataIncPrinceton.